Today – well, this week, yup, it’s a multi-parter! – I have a DIY project I’m so excited to show you! It was time-consuming, hence the lots of photos, hence the multi-parter. 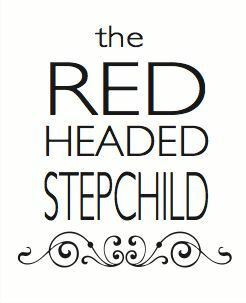 But it’s one of my favorite projects in our new home! 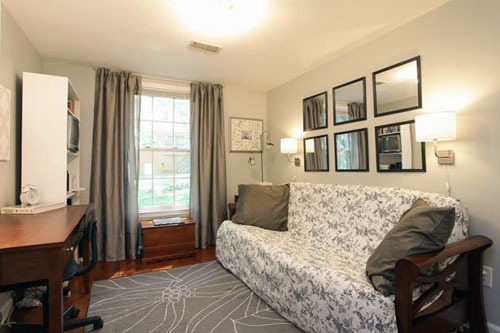 Like everyone else in the blogosphere, I’ve long had a crush on the Ballard Designs Garden District mirrors. The design is classic but the geometric shapes feel modern, and everyone knows a mirror brightens up any room (literally). So yeah. I’ve been in love. Only flaw? The price. I wanted two sets and there was no way in Hades I’d pay $500 for mirrors. I may have my frivolous indulgences, but mirrors that cost more than my furniture are not one of them. So I knew if I wanted leaded glass mirrors, I’d have to fake them. 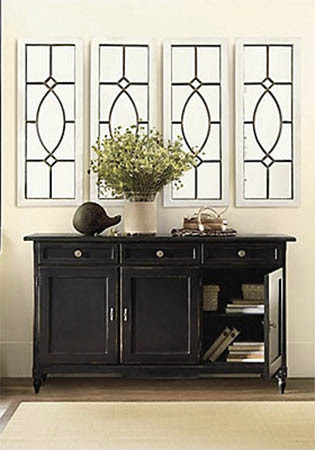 Fortunately, there are some great tutorials for truly lovely faux leaded glass or paned mirrors out there (like here, hat tip to Centsational Girl for finding it). But I decided to really pinch pennies and instead repurpose what I already had. And what I had were these mirrors, last seen in our old office. They were $4 apiece from Home Depot. Sixteen inch, black plastic frames. In other words, a far cry from those Ballard mirrors above. And a square shape? Yeah, no way to recreate those perfectly. But! I had inspiration! Inspiration that would hopefully yield a Ballard-y mirror with a glam twist. 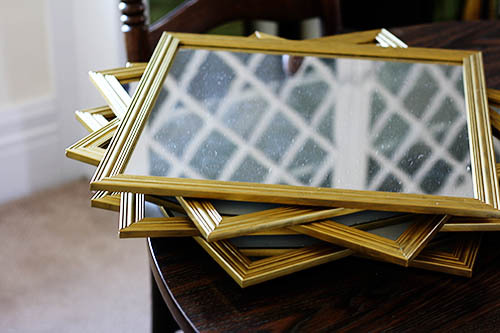 And it started with this post by Lindsay at Little House Blog, where she provides a tutorial for hand-painting black frames with gold paint. Ooh, gold! That felt both traditional and glammy to me, so I taped them off and painted away. Here’s where I admit I didn’t use Lindsay’s specific paint, because I forgot to write down which one she recommended and then when I got to the store I couldn’t remember and I couldn’t look it up because I am a luddite without a smartphone (yes, still). So I... just picked one. Hey, worked for me. 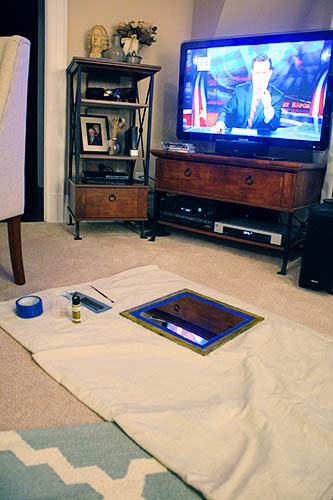 Me and Colbert, every night for a week, up late, making jokes and painting frames. As you do. So this is what our living room looked like for the better part of a week. If it was a good night, I’d get a coat done on four or five mirrors. Most nights I only had the patience for two or three. It was definitely a little crazy how much time it took to completely cover the black frame with gold paint – but also crazy how much I could stretch the paint. 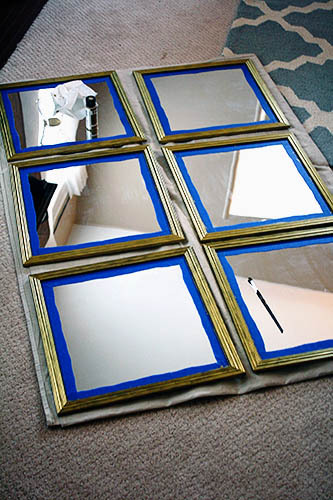 I was able to use one small bottle of craft paint for this project – that’s twenty-four coats of paint on these medium-sized mirrors! Of course, it was only able to last because I went out and bought a second bottle, halfway through, convinced I couldn’t finish with one bottle. So it goes. Still. While I love the finished hand-painted look compared to a super smooth spray-painted finish, I admit I might cut corners if I had to do it again, perhaps by spray-painting one coat and hand-painting another coat or two on top. Apartment living and a stubborn streak made me do it the hard way this time. 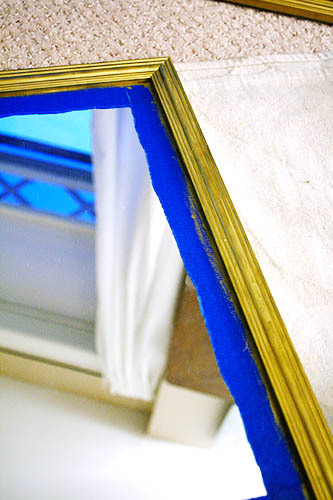 Either way, just painting the frames gold glammed them up, so that they don’t feel so much like cheap mirrors they are! Especially after they sat in a corner on the floor for six months, getting so gross and dusty. Yeesh. Don’t worry, I cleaned them before adding the faux “lead” between the window “panels”... which is a story that’s gonna have to wait until tomorrow. I’m sorry, I know, multi-parters are awful and mean and make Baby Jesus cry. But I’m just telling you about this project the same way I accomplished it, in fits and starts! But hey, until tomorrow, I hope this inspires you to bring a little gold glam into your house! I’m really starting to get into gold nowadays. And since I have that extra bottle of paint now... no black frame in our house is safe! Teaser! But you make me feel better about not going to the huge effort it would take spraying or changing out all the brass/gold here now... Ha! I've lived long enough to see it come and go, come and go... decorating trends are fickle. Wait, wha?? Gold's back in now? Awesome. Can't wait for Part 2!